Vol 4 | Issue 3 | Sept-Dec 2018 | page: 2-5 | Nandkishor B. Goyal, Sayyadshadab S. Jafri, Ashish Vinayak Patil, Aashish Babanrao Ghodke. Author: Nandkishor B. Goyal , Sayyadshadab S. Jafri , Ashish Vinayak Patil , Aashish Babanrao Ghodke . Department of Orthopaedics, ACPMMC Dhule. Dr. Goyal Hospital, near Yellammuden Temple, Malegao, Dhule 424001. Email: nandkishor596@gmail.com Dr. Nandkishor B.
Ankle injuries should not be neglected because body weight is transmitted through it and locomotion depends on the stability of this joint. For this, we are conducting a prospective study of surgical management of bimalleolar fractures with various modalities. In our study, we surgically managed 36 patients and their functional assessment was done with Biard-Jackson scoring system. Excellent functional results are obtained with stable fixation of fractures. Tension band wiring was found to be better in internal fixation of medial malleolus as compared to screws fixation whereas lateral plating was best for fibular fractures. It was found that our results were coinciding with the literature. Keywords: Biard-Jackson scoring, bimalleolar fractures, lateral plating, screw fixation, tension band wiring. 1. Marvin LS. Complication of fractures and dislocation of the ankle. In: EPPS, Charles H, editors. Complication in Orthopaedic Surgery. 3rd ed., Vol. 1. Ch. 23. Philadelphia, PA: J.B. Lippincott Company; 1994. p. 595-648. 2. Daly PJ, Fitzgerald RH Jr, Melton LJ, Ilstrup DM. Epidemiology of ankle fractures in Rochester, Minnesota. Acta Orthop Scand 1987;58:539-44. 3. Canale ST, Beaty JH. Campbell’s Operative Orthopaedics. 11th ed., Vol. 3. Philadelphia, PA: Mosby; 2008. p. 2043-66. 4. Burwell HN, Charnley AD. The treatment of displaced fractures at the ankle by rigid internal fixation and early joint movement. J Bone Joint Surg Br 1965;47:634-60. 5. Colton CL. The treatment of dupuytren’s fracture-dislocation of the ankle. J Bone Joint Surg Br 1971;53:63-71. 6. Desouza LJ. Fractures dislocations about the ankle. In: Gustilo RB, Kyle RF, Templeman D, editors. Fractures and Dislocations. Vol. 2. Ch. 30. St. Louis: Mosby Year Book Inc.; 1993. p. 997-1043. 7. Beris AE, Kabbani KT, Xenakis TA, Mitsionis G, Soucacos PK, Soucacos PN. Surgical treatment of malleolar fractures. A review of 144 patients. Clin Orthop Relat Res 1997;341:90-8. How to Cite this article: Goyal N B, Jafri S S, Patil A V, Ghodke A B. A Prospective Study of Surgical Management of Bimalleolar Fractures with Various Modalities. 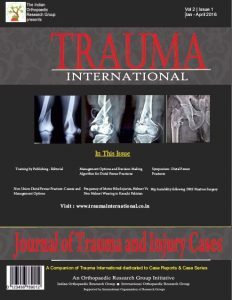 Trauma International Sep-Dec 2018;4(3):2-5.